Wow… 2014! I can barely believe it is the start of another new year. I have quite the list of resolutions this year… one is being more consistent on my blog… I know, I know… I’m off to a bit of a late start there, huh?! But for the last couple days, I have been putting some recipes from my newest cookbooks to the test, so I have lots of new favorites to share already. So here goes! This is hands down one of the best vegan soups I have ever had! Creamy, filling and absolutely delicious. Oh… and did I mention healthy? This soup mimics traditional broccoli & cheese soup yet holds its own by remaking the classic recipe with a fabulous vegan twist. The recipe is from Isa Chandra Moskowitz’s newest book ‘Isa Does It’. We devoured the entire pot (except for one bowl, which I happily took to work for my lunch the next day) – & even my 3-year-old son was a fan! And the best part? It is completely and amazingly 100% healthy. 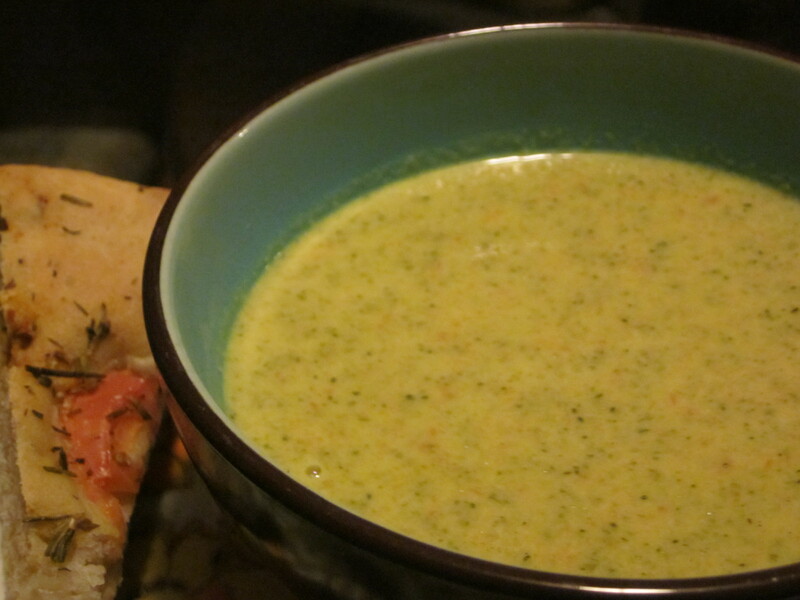 No dairy, no soy, no faux cheeses of any kind… If you would’ve told me I would be eating “cheddary broccoli soup” that contained no cheese at all, I would’ve never believed it could be this good… and neither will you. Thank god Isa was born! The secret of the creaminess lies within the cashew cream. This cashew cream is amazing stuff. I hope you aren’t allergic to cashews, because the cashew cream train is swiftly chugging along… and I’m hopping aboard! Sorry, I know I can sometimes be a little “cheesy” 😉 I didn’t have any cashews pre-soaked, so I boiled them for 15 minutes and then let them sit for as long as possible, as recommended in the book – worked like a charm. 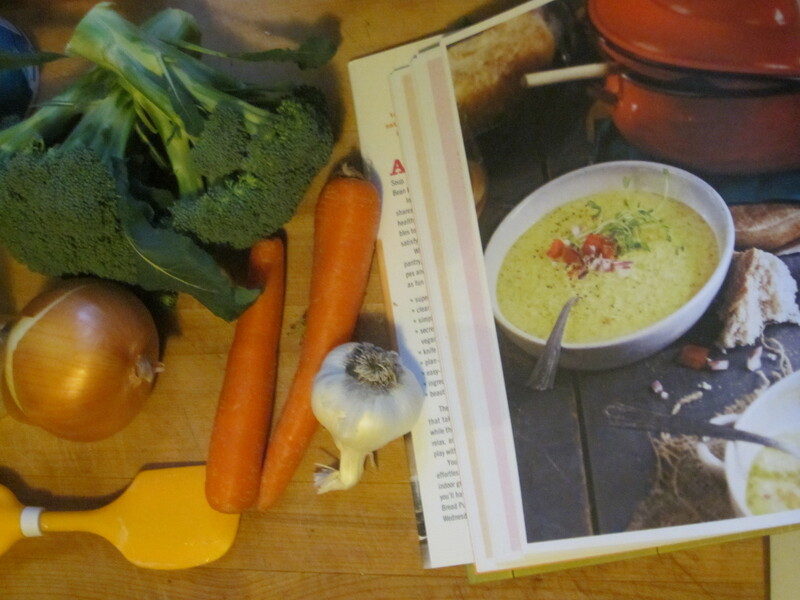 Oh – two more things – 1) You will need an immersion blender for this recipe, and 2) This AWESOME soup is not only dairy free, but gluten-free as well 🙂 Bring it on! Oooooh yeeeeeah. Serve with some homemade bread on the side for complete satisfaction. Preheat a soup pot over medium heat and add the oil. Sauté the onion in the oil with a pinch of salt – just until softened, about 3 min. Add the garlic and sauté for 30 seconds or so, until fragrant. Add the broccoli, carrots, turmeric, remaining 1/2 tsp salt and broth. Cover and bring to a boil. Once boiling, lower heat to a simmer. Cook about 10 minutes until the carrots are very tender. Can this soup REALLY be this easy? In the meantime, make the cashew cream by draining the cashews and placing them in a blender/food processor with the broth, miso and nutritional yeast. Blend like crazy, until smooth. This can take anywhere from 1-5 minutes. Scrape the sides of your blender down with a rubber spatula every now and then. (Mine was full to the brim! Unless you have a giant food processor, don’t be alarmed if a little liquid leaks out. I just wrapped a towel around the base of my mixer bowl to catch any overflow.). And voila! Cashew Cream! 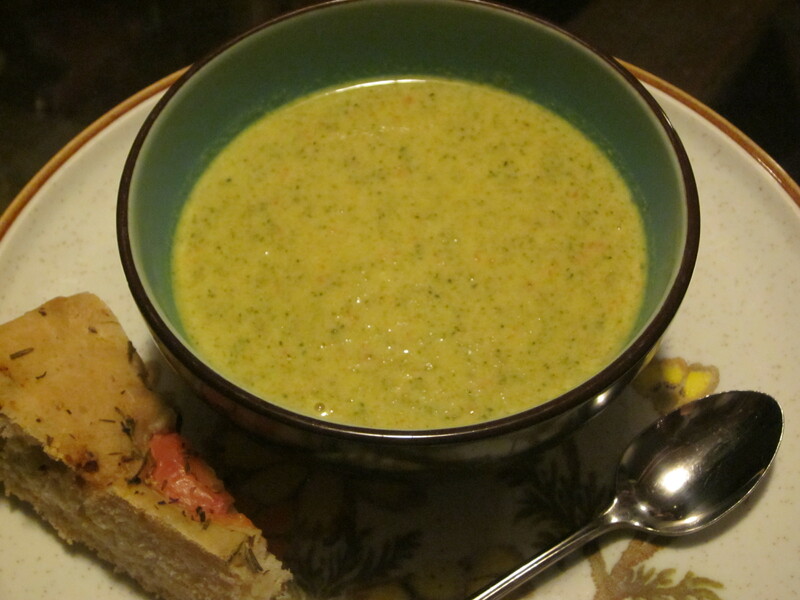 When the carrots are tender, add the cashew cream to the soup. Use an immersion blender to puree so that only tiny bits of broccoli and carrot are visible. 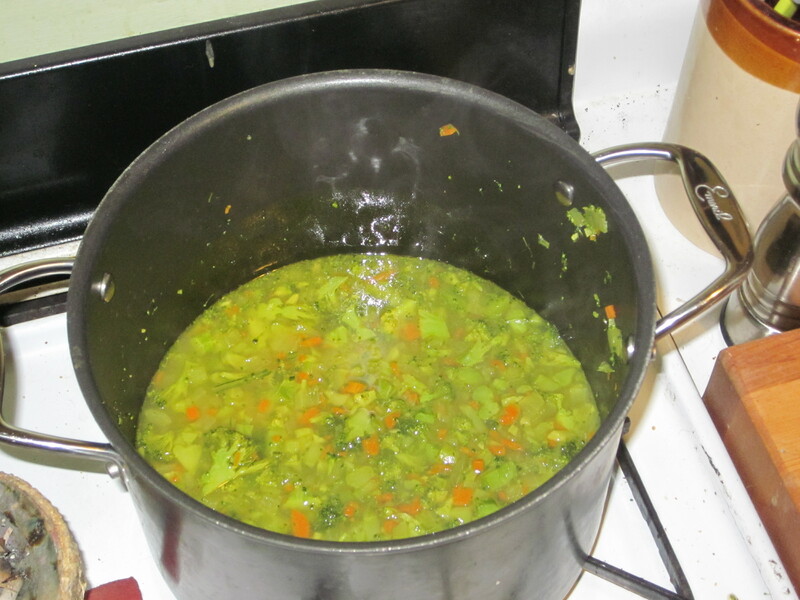 Keep the soup on low heat, partially covered for about 10 minutes, until thickened, stirring occasionally. Once thickened, add the lemon juice and pepper, taste for seasoning, and serve. It thickens a bit more as it cools, so you’ll probably need to thin out the leftovers, if there are any! And there you have it, folks… heaven in a bowl. On another note, I would like to say, only my latest posts are listed on the sidebar – Don’t forget to try my search bar if you are looking for something in particular! I’ve been writing this blog since 2011 so there’s some delicious history back up in there!